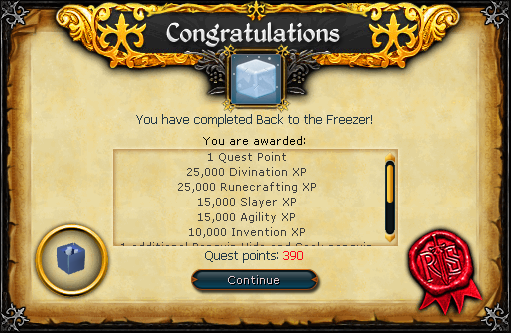 Stop RuneScape from turning into a snowball and complicate the time-space continuum all at once! To begin, speak with part-time Coca-Cola salesperson Chuck in the Ardougne Zoo. He is concerned about recent activity on the iceberg will ask you to speak with two PBJ agents, Skots and Mundsen, in Rellekka. Chuck will also give you a passphrase. Write it down or take a picture of it. Teleport to Rellekka and head to the market. Speak to either of the agents and say the correct passphrase. They will ask you to investigate the iceberg, but before you can do that you will see a flying blue box sail out of the iceberg and into the desert surrounding Pollnivneach. The easiest way to get there is by using the bandit camp lodestone and running southeast. Investigate the "T.A.R.D.I.S" contraption you find upon arrival. You will read that it is for cooling the planet, but will be unable to find any other clues. Head to the northeast and speak to Dundee the gnome. He will give you a crocspeak amulet which you can use to speak to the nearby crocodile named Croc. Following this, report back to Chuck. He will tell you that one of the penguins near TARDIS is a PBJ agent, but the only thing he knows about him is his favorite food (which you should memorize). Chuck will also hand you a penguin disguise if you already do not have one. Head back to TARDIS. 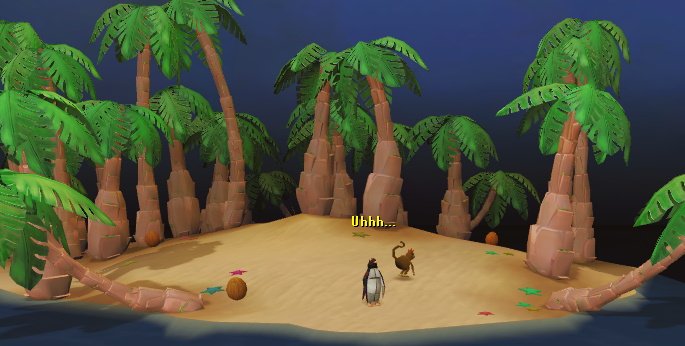 Remove anything on your hands and your cape and climb into the penguin disguise. Speak to Elon, Gordon, Hugh, and Emperor Wing who will tell you exactly what happened and something that they did at the party. Use this information and the spy's favorite food to discern who the spy is. Gordon. The spy will tell you that the TARDIS machine is well on its way to freezing the entire planet, and the only way to fix the situation is by going back in time and sabotaging the machine using an experimental time-traveling device. To locate said device on the iceberg, he will give you a locator that looks awfully like a garden trowel and the PIN for the location "1234," which is coincidentally the PIN for my luggage. If you have difficulty remembering this combination, write it down. Teleport to the Rellekka lodestone and head north to take the canoe to the Iceberg. Begin digging with the GPS device, and search every coordinate asked for. Eventually you will find a hidden bunker. Now use Jim to climb into your penguin suit and enter the bunker (using the 1234 PIN). You should find yourself in an underground ice bunker. You will have to search around the rooms and find random items. To start, enter the room to the east and search one of the cupboards for a hat. Continue to the Some Like it Cold storage room in the southwestern area of the floor and search the crates here to find a hammer and a piece of flax. In the most northwestern room, chip off a piece of ice from the ice maker to get ice cubes. Combine these items and you will receive the flax cap-ice-i-tor . Now search the ice shelf to get a book on penguins. Head to the locker room in the center of the compound to find an incomplete de-loreing device. Use the incomplete de-loreing device on the book to get a fully operational de-loreing device . Now click on the device to travel back in time!!! It appears the device needs some fine-tuning. Pick up the monkey wrench on the island and use it on the device. Click on the device again and you will find yourself on a grassy area with ping and pong locked up. Speak to the rock stars and then pick up the penguin bongos and cowbell near the gallows. Use the cowbells on the de-loreing device and then operate it once again. Now you will find yourself in a cabbage field (with Paul and Andrew!). Take a cabbage and rub it on the device. Now you will find yourself in the mining guild with several mining bots. Speak to the man with the dragon pickaxe, who will give you a pair of boots. Use the boots on the device to "re-boot" it, and operate it again. You should find yourself perfectly fine in the past. Enter Gordon's laboratory in the southwest room of the floor and speak to Gordon. Gordon will be hesitant to break the machine, fearing it would cause a time-travel paradox. He asks you to find Elon. Speak to Elon in the large northern room near TARDIS, who will give you a list of things to procure. Killerwatt energy - Kill killerwatts for this. The portal to the killerwatt plane is near Ernest the Chicken in Draynor Manor. Each Killerwatt is level 61 and drops 10 killerwatt energy. This is the only item you need to leave the area for. Lemon sole rune - Head to the room north of Gordon. Collect enough snowballs for your item list and then search the crate to find a lemon. Use this lemon on the mysterious ice block, which will allow you to craft these strange lemon runes. Fishvention rod - Pick up a fishing rod in the southern war room (where Filip is) and then search the Some Like it Cold storage room until you find a cog. Combine these. 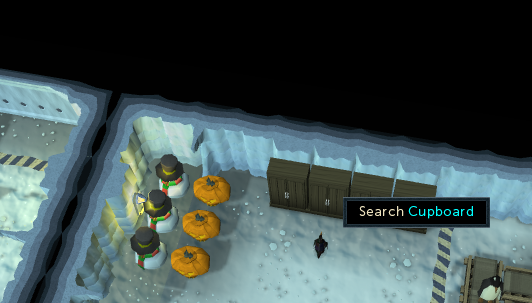 Ice box - With the ice cooler from a slayer master in your inventory, chip off a piece of ice from the ice maker in the most northwestern room. Coolant holder - Search the Some Like it Cold storage room for a coolant holder. Now chip off a piece of ice from the ice maker in the most northwestern room. Return to Elon with these items. He will ask for some form of energy to power the device. Return with 50 of each energy: Flicking, Bright, Sparking, and Gleaming energy. These do not have to be collected and may be bought. Once you have the energies, load them into the energy container and click on the battery control station nearby. To calibrate the machine, you will have to play something similar to the board game Mastermind. It involves guessing and finding what works by trial-and-error. A white square indicates a correct color is placed in the wrong position, whereas a gray square indicates one of the colors is placed in the correct position. Once you have solved this, report back to Elon, who in turn will ask you to tell Gordon, Hugh, and Emperor Wing. Hugh can be found in the most northwestern room and Wing can be found slightly south of the TARDIS machine. When speaking to Wing, he will reveal that he has absolutely no idea how to fly TARDIS and that you must fly it. The coolant(s?) will leak, leaving you with no other choice but to comply and pilot TARDIS. You will crash southwest of Pollnivneach. 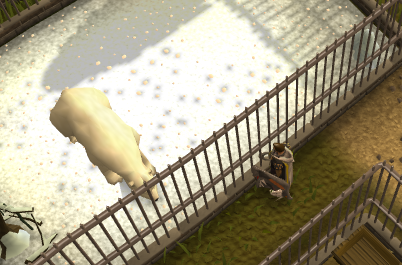 Return to Chuck in Ardougne Zoo. He will tell you the whole time travel was unnecessary - the TARDIS that crashed at first was already weakened by you - but if you hadn't gone back in time, it could have wrecked the climate. Chuck offers a reward for your help.